Shisha Café offers a delicious Lebanese cuisine is supported with herbs from spice your appetite mebuat rise and a comfortable atmosphere. 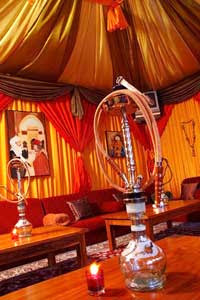 Supported also by Shisha, the Arab-style smoking sensation with different flavors to refresh your mood with relationships, family and your friends. Appetizers: Mezah Fiesta, Arayes, Lebanese Salad. Drinks: Jallab, Sahara Tea, Snow on the Sahara.